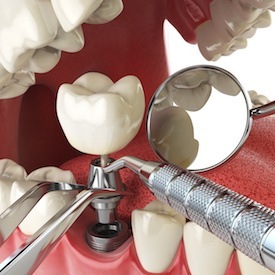 Traditionally, patients who had lost an entire row of teeth would receive a removable denture. These tooth replacement prosthetics restored those parts of the smile visible above the gum line, but without the supportive root structures, these restorations are only half complete. Dental implant supported dentures are a far superior solution for many patients. Implant posts strategically positioned along the jawbone anchor the denture firmly in place, and they provide the stimulation necessary to maintain adequate jawbone density and gum tissue volume. However, many patients need advanced bone or soft tissue grafts to receive these dental implant supported dentures. Instead, All-on-4 offers the stability of implant supported dentures, but the All-on-4 system utilizes the naturally denser parts of the jaw rather than tissue grafts. If you want to learn more about All-on-4, call La Plata Dental to find out more or schedule an appointment in our state-of-the-art dentistry practice. 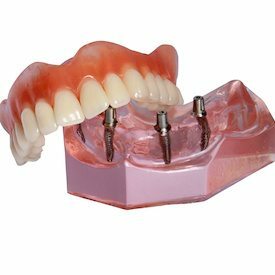 All-on-4 is a unique implant supported denture system. Rather than placing dental implants along the jawbone, implants are positioned to fuse with the naturally denser parts of the jaw at the front of the mouth. Two implants are positioned vertically to support the front of the denture, and the other two are placed diagonally from the back of the denture to the front of the jaw. This provides the same natural form and function possible with implant supported dentures without the need for advanced preparatory tissue grafts. What is the All-on-4 Process? 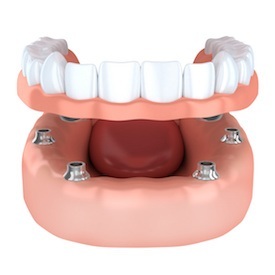 All-on-4 dentures are placed in two phases. During the initial appointment, we surgical position the dental implant posts into the front of the jawbone using the innovative All-on-4 technique. Then, a temporary denture is usually attached. These temporaries are removable, and we recommend that patients that them out at least during sleep. It will take several months for your implant posts to fuse fully with the supportive bone and gum tissue. Once the dental implants are fully fused, you’ll return to our office where we can attach your final, fixed denture. Am a I Candidate for All-on-4? Any patient missing a full row of teeth may be a candidate for All-on-4. We recommend patients consider All-on-4 if they want to avoid the need for preparatory grafting or if they want to improve chances for successful implantation. 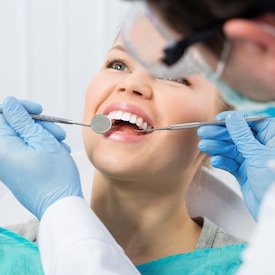 During a tooth replacement consultation, we’ll evaluate your smile and help you find the restoration option that meets your needs. How Long Will My All-on-4 Denture Last? With proper at-home care and regular dental appointments in our office, you will be able to keep your dentures in place for two or more decades. A large percentage of patients keep their All-on-4 dentures for the rest of their lifetime. Once your All-on-4 denture is in place, you can continue to brush your teeth as usual. You may want to switch to a softer toothbrush or less abrasive toothpaste. Otherwise, your tooth brushing routine can continue. Flossing between teeth is not usually necessarily, but you may want to use specialized flosses or water flossers to clean the space between the denture and gums. Otherwise, a quality antimicrobial mouth rinse may be adequate to remove plaque buildup at the gums.